During the construction stage, the contractor, or commonly referred to as administrator (sometimes referred to as architect’ or ‘contract administrator’, ‘engineer’, ‘project manager’ or simply an agent’) holds regular construction progress assessment meetings which are attended by the necessary members of the project consultation team. 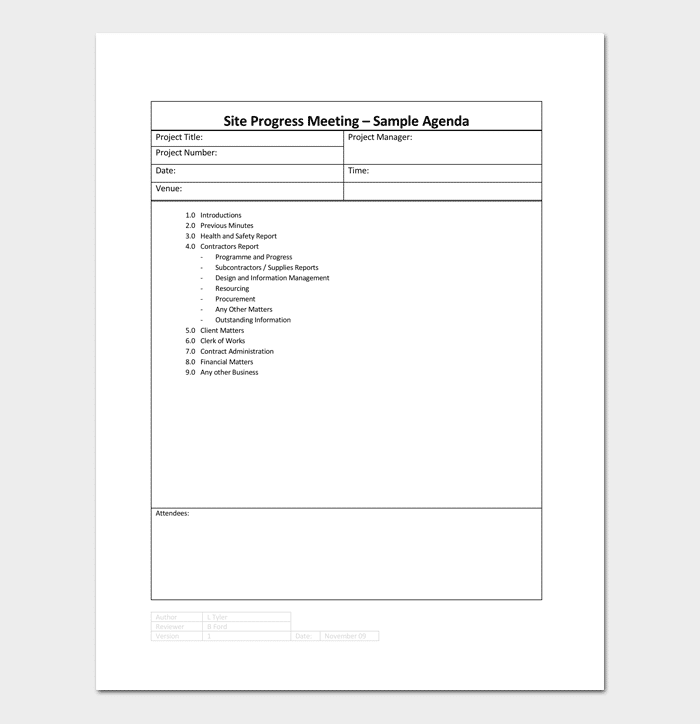 Recording the minutes of the meeting is also important as it remains a document of citation; this can be prepared using a construction meeting agenda template so that one can record faster and more efficiently. The client, its representative or the project manager may also tend to attend these types of meetings. 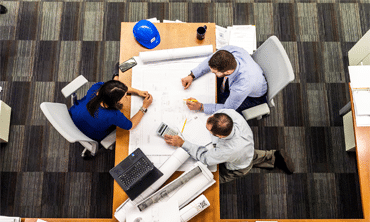 Construction progress meetings require decisions to be made instantly and so it is quite important that they are attended by mostly senior individuals only if future delays are to be avoided. Representatives of the laborers are also tend to present their view of the project and what changes they need the bosses to make in order to maintain a smooth functioning of all works. Usually, sub-contractors present an overview of the work done to the contractors and then they are accessed on their face value. Receiving and reviewing project progress reports are an important part of the monthly or fortnightly meetings. Even a minute delay of a single day can increase the production cost, hence, proper quality control and tastings are planned in order to access and authenticate the already done work. Good documentation of the meeting minutes will help avoid arbitration, mediation, or litigation. It will further help in resolving things without needing the intervention of a third party. However if some things go wrong and you have face a legal battle, you know your case is better represented and then, documents can always testify. Well documented meeting minutes are the best offensive defense in case of disputes between any two parties. 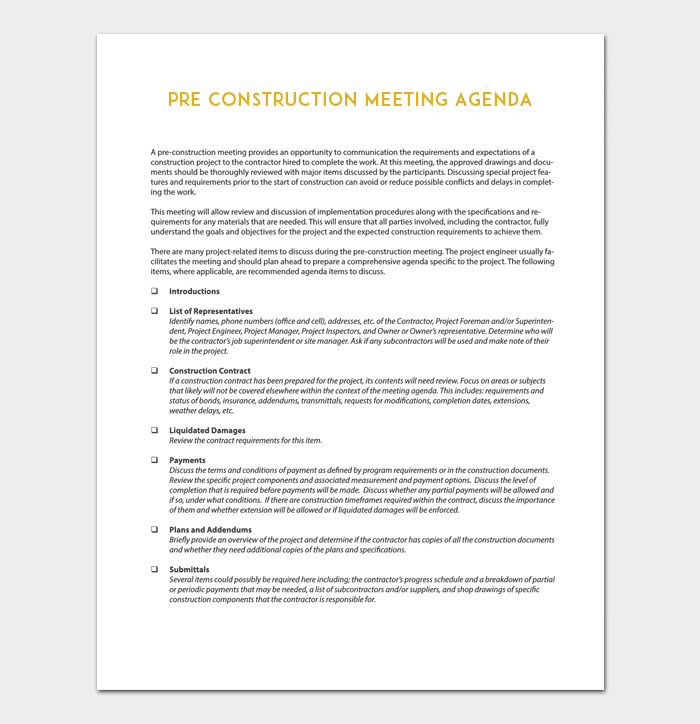 In these cases, a construction meeting agenda template might help you in preparing the minutes in a quick time. Why to sit and face the same people over and over again? It is better to use a template in order to avoid any manual errors. 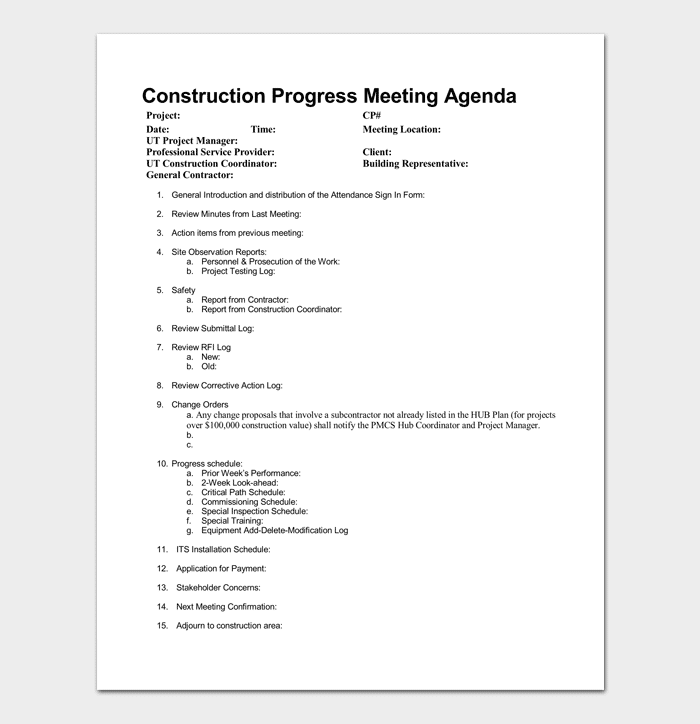 Construction Site meetings are a crucial part of successful management of construction projects. Regular onsite meetings between different stakeholders working on a single project can help in facilitating better communication and create a shared sense of purpose. As project failures are often accredited to inadequate management, in which a key factor being lack of proper communication between concerned parties. The primary reason for summoning concerned parties for a project progress meeting is to access the smooth functioning of the projects by keeping the deadline in view. Moreover, a progress meeting should be as brief as possible, of around an hour or so and everyone should understand the prime objectives, which is simply an update on where the current project stands with respect to its planned schedule and to see whether any issues are affecting the progress. Thanks to better communication, your projects will run smoothly with fewer items that will fall through the cracks. It is quite important that concerned person is doing the right thing at the right time and a habit should be formed to create written reports and communication on this. While assuming that everybody knows what to do (because it’s its job, right?) sooner or later unsatisfactory surprises will follow suit and what seems straightforward and logical to you will not be the case with others. 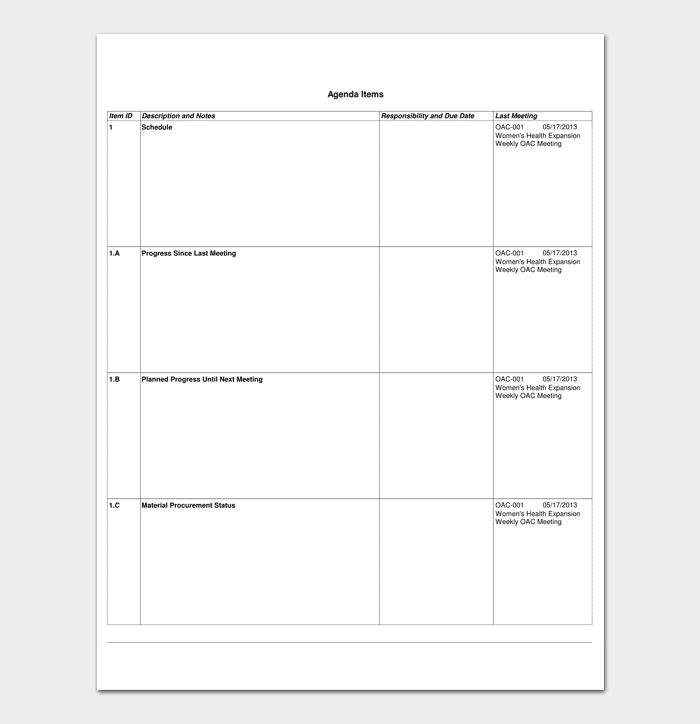 Meetings avoid such scenarios and keeping a track of the minutes helps in reviewing the discussion topics as well.